The term "injury" from the Latin "in+jus" meaning "not right," refers to human damage from acute exposure to physical and chemical agents. Ocular trauma is a major cause for monocular vision impairment worldwide but does not usually give rise to bilateral visual loss, hence, blindness from injury often miss the epidemiologists' list. The impact of ocular trauma can be enormous as population at risk is usually the productive age groups and the potential person-day's loss of work associated with treatment of the sequel of the trauma. It has become more important as rapidly declining regular workforce is being replaced by contract/marginal worker worldwide. During last decade (2001-2011 census data), India gross domestic product (GDP) has become one of the fastest in world economy that involved participation by marginal laborers which has increased from 22% to 26% of total workers (120 million of total 480 million workforces in India). They are less trained and by definition work for <6 months, so more prone to injuries often leading to more disastrous consequences both physically and economically. With the industrialization and technological change, a major expansion took place in the development of transport and communication networks. Furthermore, over time due to population growth, there has been a massive shift in the labor force from rural to urban and from agriculture to industry accompanied by a heavy dependence on the service sector. As a result, more and more people are becoming exposed to injury producing agents such as mechanical, electrical, thermal or chemical energy. In the world today, mechanical energy has remained the most important cause of injury but the paradigm is changing as far as the host - agent factors are concerned. Looking up into the literature, we could not find any study on ocular trauma in these categories. Bokaro in Jharkhand is the most industrialized zone in India with biggest steel plant in Asia. In next 5 years, half of Indian steel will be produced here. Marginal labor in Jharkhand is highest in India. 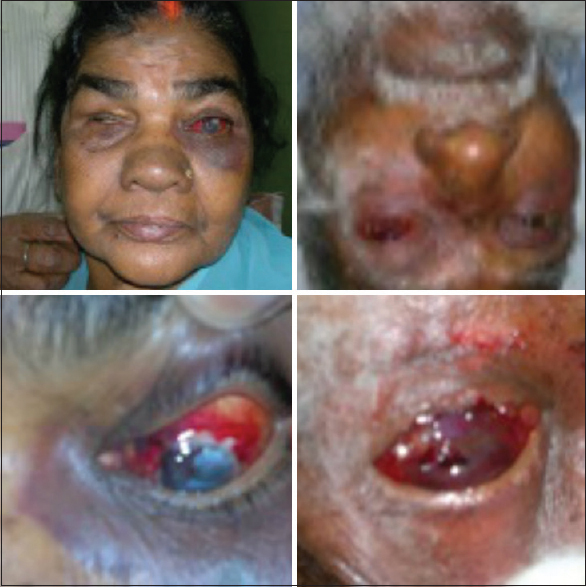 Ocular trauma in and around the steel plant has impact on this. On this background, we conducted a prospective study on ocular trauma at our health service network which is an on-going project under the central government Public Sector Units. A prospective interventional study on all cases of ocular trauma attending our healthcare network has been going on since 1995. 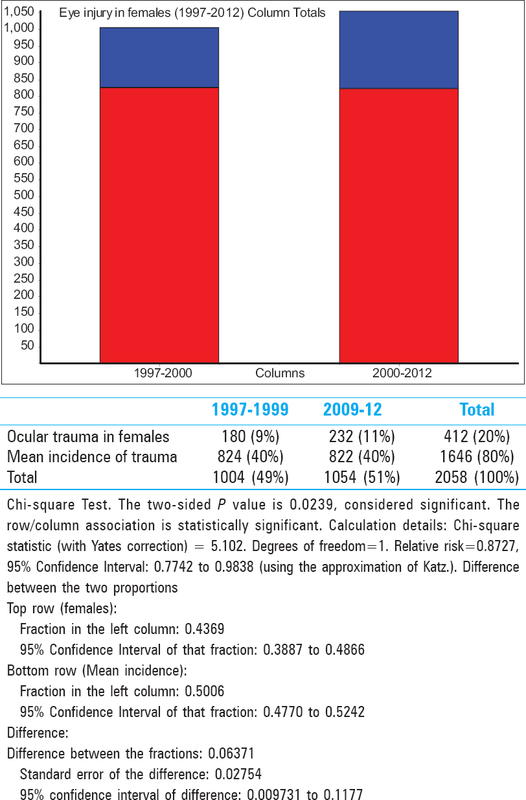 Detailed information on the nature of trauma, agent and setting are analyzed during 1997-2012. Serious cases are those who had visual impairment on presentation/advised rest for more than24 h/hospitalized for treatment. All injuries are accidental in nature except those uncategorized injuries which are inflicted upon with an ulterior motive. This last group has never been studied or included in any literature. Bokaro population includes all four categories of workers and catered by our 910 bedded super-specialty hospital, Occupational Health Service Centre, health centers and peripheral developmental centers. Thus, any study using this healthcare service system represents a proper worker profile who sustain ocular trauma during last 15 years. A comprehensive ocular examination is carried out at the main hospital after obtaining necessary informed consent. We collected demographic, medical, and surgical history details from each participating subject before the ocular examinations. We obtained a history of ocular trauma in any eye from subjects participating in the study using the question "have you ever suffered from any eye injury in the past?" to elicit this information. We recorded details of the most recent event of trauma as recalled by the subject, including the type of injury, the age of trauma, the setting of injury, and place where treatment was sought for the trauma, if any. The ophthalmologist rechecked for a history of ocular trauma if signs of ocular trauma were evident on clinical examination, but history was not available for patient interviews. The ophthalmologist determined whether trauma was an underlying cause for decrease in visual acuity for subjects with visual acuity worse than 6/18 in any eye. We defined vision impairment as best corrected visual acuity between 6/18 and 3/60 in the better eye, and blindness as best-corrected visual acuity worse than 3/60 in the better eye. We estimated the age-adjusted (adjusting to population of India as per census 2011) prevalence with 95% confidence intervals (CI) for blindness caused by trauma. CI for prevalence estimates and odds ratios (OR) from the regression analyses were calculated. The Chi-square and Fisher exact test is applied to look for significance between categorical variables as appropriate. We used the youngest age at trauma to determine the mean age at trauma and for analysis involving age at trauma for subjects with trauma in both eyes. We estimated the OR (95% CI) for factors associated with trauma and with blindness from trauma in a multiple logistic regression models that included gender, education, and occupation as variables. Mantel-Haenszel OR were estimated to determine whether the type of trauma, education of subjects or occupation determined the use of services from an eye specialist or a traditional healer. We considered P values 0.05 significant. All analyses were conducted after applying the appropriate record weights. For each year (1997-2012), eye injury incidence rates were calculated both overall and according to gender and race, using denominators obtained from India census 2011. As everyone in the population was theoretically at risk for eye injury, this denominator is appropriate. Frequency distributions were created for injury type and cause. Poisson regression was used to calculate the trend in the rate of eye injury over the study period. 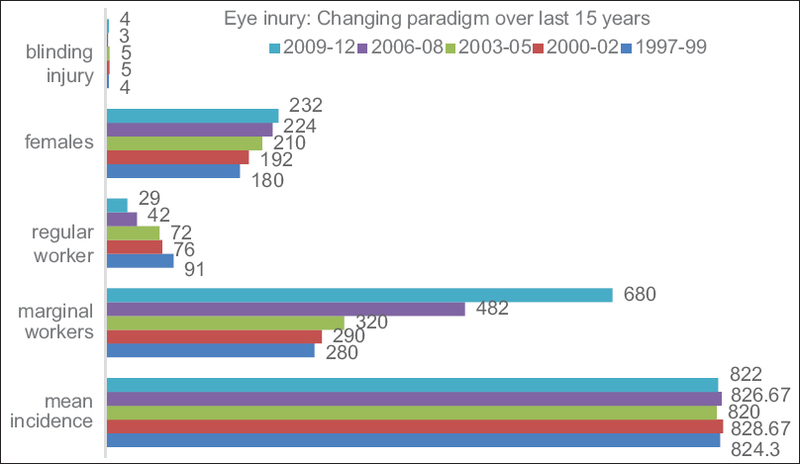 During last 15 years (1997-2012), 12,365 eye injuries were registered in this prospective study, 1241 serious cases which needed hospitalization/rest from duty or visual impairment. Mean age is 45.8 with bi-modal pattern of incidence highest among third and sixth decade, 3:1 male-female ratio (n9273:N3012). Totally, 5936 cases (48%) workplace injury included 5333 case or 90% in marginal laborers with an exponential annual increase. 595 cases or 10% cases from garage mechanics. A total of 1862 cases or 60% of eye injuries in female were related to "social violence." Multivariate analysis has detected new risk factors [Table 1], [Figure 1] [Figure 2] [Figure 3] a and b]. 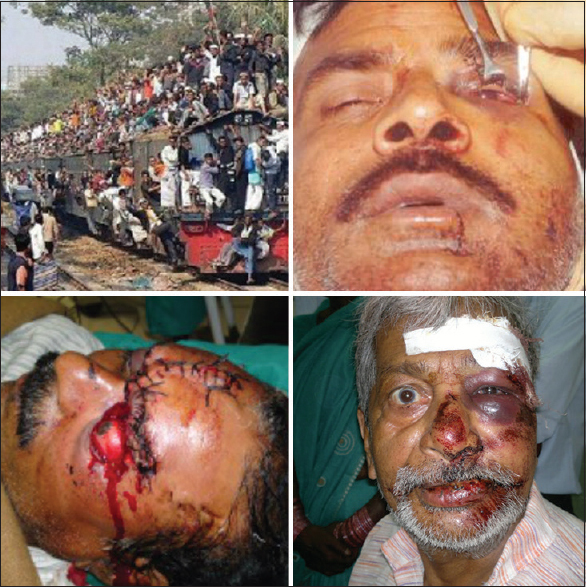 Figure 2: Increasing eye injuries in marginal workers (a) Social and occupational injustice?. (b) Ensuing occupational "epidemic"
The most common injury were of nonserious category which had no visual impairment or did not require hospitalization or rest from duties (n111234). This category includes corneal abrasion, traumatic conjunctivitis, sub-conjunctival hemorrhages, hydraulic oil spillage. Of 1241 serious cases, 80% had closed globe injury. Open globe injuries included perforation with metal splinter, road traffic accident - roadside accident (stone flying from speeding wheels) [Figure 4] [Figure 5] [Figure 6]. Mean yearly incidence of serious festivity injuries is 18.5, which include fireworks injury (unexploded firecracker, falling rocket sticks, etc.). 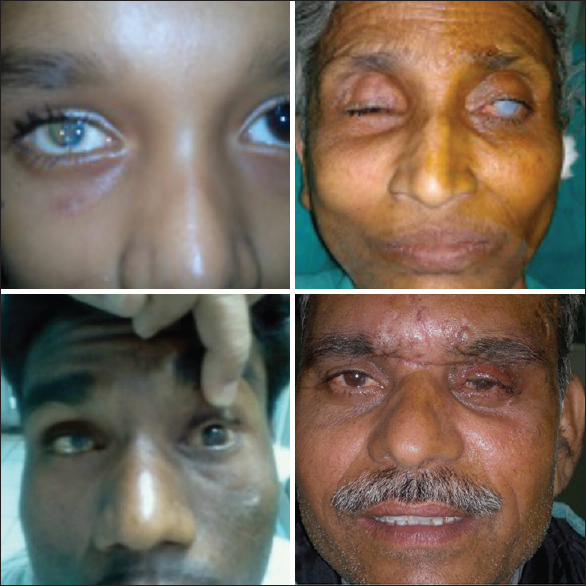 During diwali, serious ophthalmia nodusum due to caterpillar while collecting banana trees for festivity. During holi, fall on hand pumping tub well-caused blinding open globe injury in 4 cases. Muharrum time injuries include perforating injuries by fluorescent tube lights, sharp weapons [Figure 8] and [Figure 9]]. Prevalence - 0.45/1000 (Bokaro population 2011:20 lakhs) 80% closed globe, mean yearly incidence of injury 824 cases/year which has not changed significantly during the study period (1997-2012). From the study population, calculated prevalence is 0.45/1000. Necessary correction was applied as this was not a population-based study. 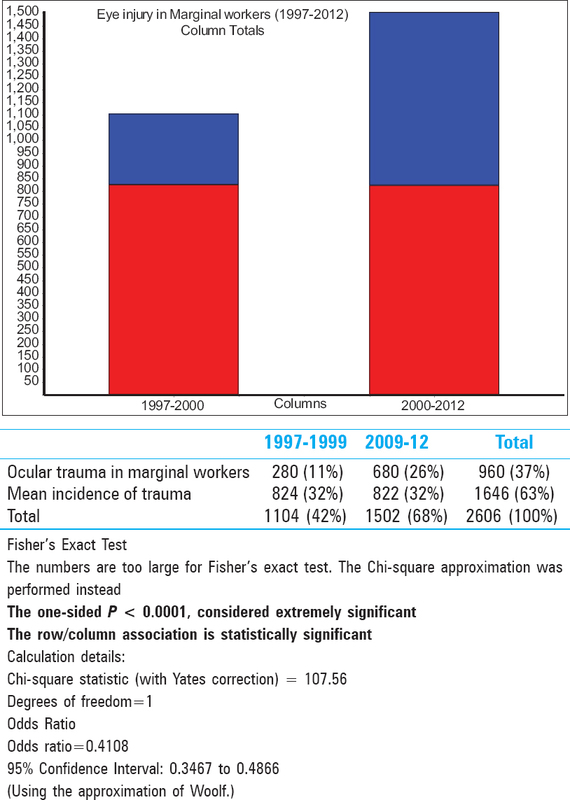 Eye injury in marginal workers was increased from 280 cases in 1997-2000 to 680 in 2000-2012 which is highly significant statistically (P < 0.01). This can be explained by an increase in female marginal workers and social violence [Figure 10]. 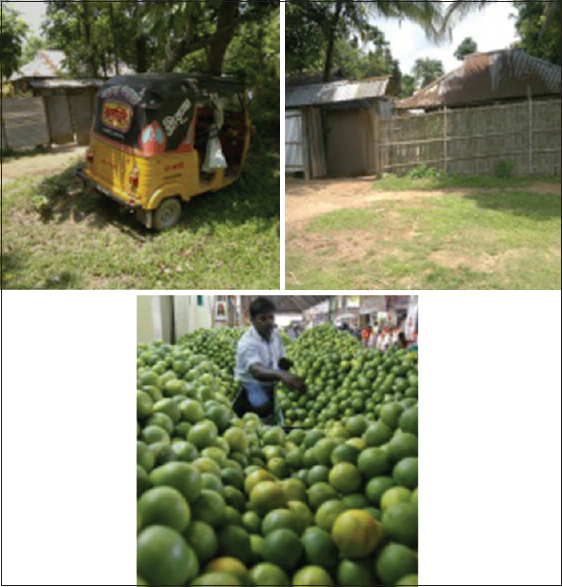 In the male: Incidence is rising due to marginal labor increase, increase in agricultural laborers (AL) as compared to cultivator (CL). Household industry related injuries increased from 8 cases in 1997 to 24 in 2012 mainly due to unaccustomed laborer, use free distribution of "gifts" (bicycles which are poorly maintained) and preventive articles (mosquito nets for malaria, dengue without proper back up where strings are often very sharp). Motor vehicle specially bikes related injury registered a leap from 12 in 1997 to 82 in 2012 due to untrained and unauthorized workshops. 50% of which result in visual impairment. Fencing related injury has increased from 12 cases in 1997 to 24 in 2012 due to use of metallic sheets in place of hedge/bamboo [Figure 11]. Incidence of blinding eye injuries remain the study with 1.6 cases/year, however, outcome has improved in potentially blinding trauma due to better surgical infrastructures. ,, Significant reduction in excision of eyeball ,, has been seen (2.1 cases/year during half of this study period and only 1 case in the second half) [[Figure 12]. Broad categories of economic activities also known as four-fold classification of the workers are, CLs, AL, working in household industries (HHI) and other workers (OWs). The CLs and AL broadly show the workers engaged in the agricultural sector, except those engaged in plantation activities, which, over the censuses, have been considered as a part of "OWs"
Among the states/union territories s, Uttar Pradesh has reported the highest numbers in all the categories of workers, with 19.1 million CLs, 19.9 million AL, and 3.9 million in HHI and 22.9 million as OWs. It is well-known fact that every 15 s, a worker dies from a work-related accident or disease and every 15 s, 160 workers have a work-related accident every day, 6300 people die as a result of occupational accidents or work-related diseases - more than 2.3 million deaths/year. 317 million accidents occur on the job annually; many of these resulting in extended absences from work. 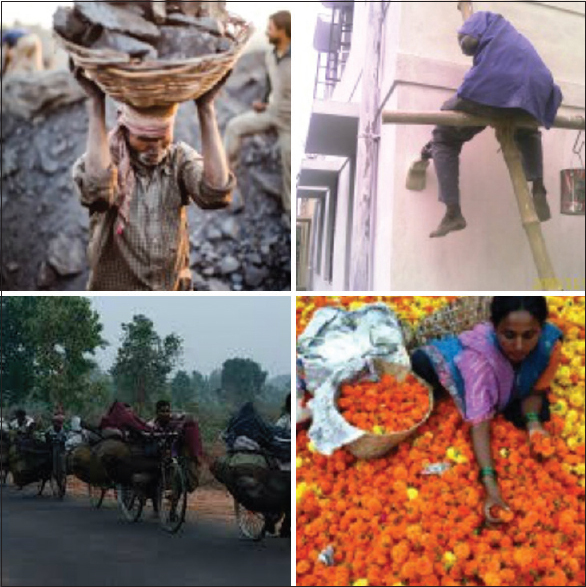 The human cost of this daily adversity is vast, and the economic burden of poor occupational safety and health practices is estimated at 4% of global GDP each year. The safety and health conditions at work are very different between countries, economic sectors and social groups. Deaths and injuries take a particularly heavy toll in developing countries, where a large part of the population is engaged in hazardous activities, such as agriculture, fishing and mining. Throughout the world, the poorest and least protected-often women, children and migrants are among the most affected. Since long, injuries were considered synonymous with "accidents" implying that occurrence of such events was sudden and caused by external factors. Assuming that these factors were random and uncontrollable acts of fate and luck, injuries remained a neglected field of research in the past. Some studies have been carried out in developed countries to estimate the magnitude, severity and consequences of injuries and accordingly appropriate safety measures, laws and regulations have been devised to prevent them. Recently, the epidemiologist of developed countries have expanded their area of etiology of diseases to include injury and have contributed toward the understanding of causal relationships among risk factors, events and the outcomes of injury. In contrast, so far not much attention has been paid to injury awareness, prevention and control in the developing countries. Not many efforts are made to learn from the experiences of developed nations, and a very few open fora are organized in the developing countries for the dissemination of research findings of the developed nations. Pioneering work on defining agents of injury was done by Gordon; he suggested that injuries behaved like classic infectious diseases and were characterized by epidemic episodes, seasonal variation, and long-term trends and demographics distribution. He further argued that each injury was the product not of one cause, but of forces from at least three sources which are the host, the agent itself and the environment in which host and agent find themselves. Our results can clearly be explained by Gordon's theory. According to Haddon,  unlike disease, the exposure causing injury is sudden and the damage is quick and severe; besides energy induced or exposed, injury also results from absence of essentials such as lack of oxygen or heat. Haddon further expanded the work of Gordon by including the time dimension in injury-producing factors and created a landmark in the prevention measures of injury; often referred to in the literature as "the Haddon matrix." The matrix includes three phases of injury as "preevent," "event," and "postevent"- as rows and the interacting factors, which cause injury over time as columns, include host, agent (or vector) and environment (physical and socioeconomic). The World Health Organization (1977) in its International Classification of Diseases tried to explain the typology of injuries in terms of external causes (agents) and associated pathological outcomes. The classification has helped a great deal in addressing the issues of acute effects and long-term disability resulting from injury; however, it failed to provide adequate attention to the associated socioeconomic and psychological consequences. Domestic violence is rooted in a dynamic of unequal power and control that escalates to physical, Sexual, or psychological abuse. In homosexual relationships,  this dynamic is often compounded by homophobia and the victim's fear that sexual orientation will be exposed. Domestic violence is the second leading cause of injury to all US women and is the leading cause of injury to American women 15-44 years old. Approximately 25% to 45% of abused women are beaten during pregnancy. Of women seeking medical assistance at emergency departments 22-35% are there because of domestic abuse, and of these, only 5% have their situations correctly identified. Partner abuse observes no ethnic, geographic, religious, or socioeconomic boundaries. Some studies suggest that abusers probably experienced violence during their own childhoods and probably abuse alcohol. 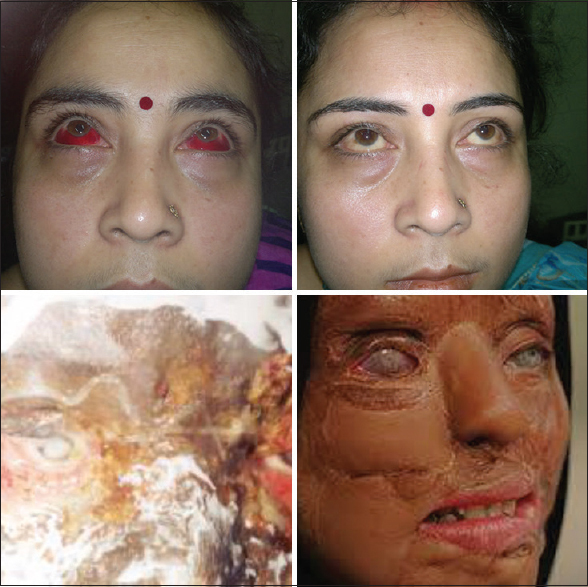 Our study result has shown disturbing in "social" eye injuries due to acid attacks, dowry exploitation, etc., This is very important finding of this study (hitherto unreported) as an intervention at this stage can prevent lethal consequences. Furthermore, most of the social injuries in females and work injuries in marginal workers are not "notified" to appropriate administrative authorities. However, treated with secrecy from abuser/employer due to complex socioeconomic reasons. Hence, this study emphasizes bigger role of an eye care provider in days to come. The greatest change in the paradigm of ocular trauma is yet to come: Understanding ever-changing pattern in "host-agent-event reaction" in eye injury will enable us to prevent, treat and rehabilitate the affected. Increasing eye injuries in marginal workers and rising "social injury" to female eyes are indicators of socioeconomic imbalance. An accident is an opportune time for secondary prevention messages. 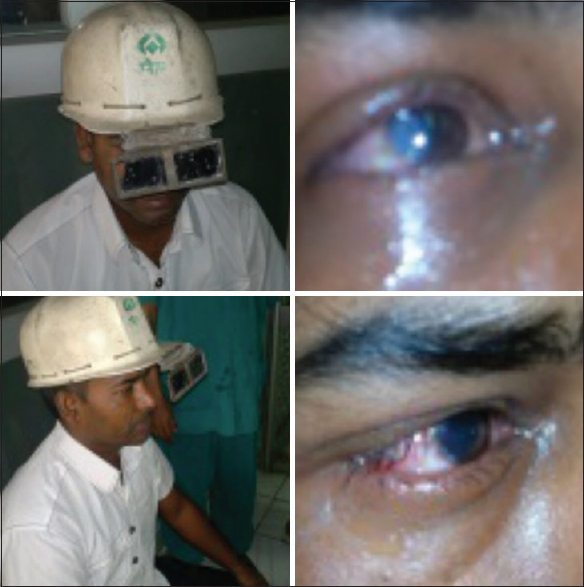 Ocular trauma at workplace is a sentinel event, indicative of failure of protection in that system - an eye care provider should capitalize on this opportunity to send a strong message to the employer, administration and society (Dr. Frost). "Ophthalmologists have a huge role to play to dramatize the problem. They see the drama of failure. You can look at statistics, rate in graphs and charts, but one photo or description of the devastation of an eye injury to get people ponder blindness is very powerful. The horror of the medical outcome speaks very loudly." Venis S, Horton R. Violence against women: A global burden. Lancet 2002;359:1172. Sleet DA, Dahlberg LL, Basavaraju SV, Mercy JA, McGuire LC, Greenspan A, et al. Injury prevention, violence prevention, and trauma care: Building the scientific base. MMWR Surveill Summ 2011;60 Suppl 4:78-85. Haddon W Jr. A note concerning accident theory and research with special reference to motor vehicle accidents. Ann N Y Acad Sci 1963;107:635-46. Gordon JE. The epidemiology of accidents. Am J Public Health Nations Health 1949;39:504-15. Available from: http://www.who.int/classifications/icd/en/HistoryOfICD.pdf. [Last accessed on 2013 Sep 16]. Warthen DM. A survey of ocular trauma. Surv Ophthalmol 1971;211:285-90. Desai P, MacEwen CJ, Baines P, Minassian DC. Incidence of cases of ocular trauma admitted to hospital and incidence of blinding outcome. Br J Ophthalmol 1996;80:592-6. Rajan SI. Demographic ageing and employment in India. ILO-Asia Pacific work Paper Series. Asian Decent Work Decade 2006-2015, ILO. Available from: http://www.ilo.org/wcmsp5/groups/public/---asia/---ro-bangkok/documents/publication/wcms_140676.pdf. [Last accessed on 2013 Sep 16]. Kuhn F. Ocular traumatology: From military medicine to individual brilliance. Graefes Arch Clin Exp Ophthalmol 2013;251:627-8. Estimating the Economic Costs of Occupational Injuries and Illnesses in Developing Countries: Essential Information for Decision-Makers. Author: Seiji Machida published by ILO 2012.http://www.ilo.org/wcmsp5/groups/public/---ed_protect/---protrav/---safework/documents/publication/wcms_207690.pdf. [Last accessed on 2013 Sep 16]. Négrel AD, Thylefors B. The global impact of eye injuries. Ophthalmic Epidemiol 1998;5:143-69. Thylefors B. Epidemiological patterns of ocular trauma. Aust N Z J Ophthalmol 1992;20:95-8. Mieler W. Overview of ocular trauma. In: Albert D, Jakobiec F, editors. Principles and Practice of Ophthalmology. 2 nd ed. Philadelphia: WB Saunders Co.; 2001. p. 5179. Wong TY, Tielsch JM. A population-based study on the incidence of severe ocular trauma in Singapore. Am J Ophthalmol 1999;128:345-51. Wong TY, Klein BE, Klein R. The prevalence and 5-year incidence of ocular trauma. The Beaver Dam Eye Study. Ophthalmology 2000;107:2196-202. McGwin G Jr, Hall TA, Xie A, Owsley C. Trends in eye injury in the United States, 1992-2001. Invest Ophthalmol Vis Sci 2006;47:521-7.